I love straw hats on Miss H, she just looks so cute and summery in them! I found this plain hat (just £3 in Primark) and the brim is fabulous, but I wanted to make it really stand out with adding peonies. We get so much chocolate at Easter I wanted to make a non-chocolate Easter gift. I had a look on Ebay and bought a posy of peonies (ooh alliteration!). I chose ones for around £5, and crossed my fingers that they would be nice when they came. As you can see I struck lucky and they were very pretty. First take your flowers and cut off the stems (I know, I know, this made me anxious too, but feel the fear and do it anyway), cut off any leaves too as these are nice as a bit of background foliage. Then arrange the flowers how you would like them in the final design. (Don’t just rush in with the glue gun however tempting that is). Once you have got an idea of how it looks – great, you are ready to go. Perhaps take a photo to remind you if you need to check back. Begin by arranging the leaves as background foliage. Then begin to build up your flowers. Be generous with the glue, then no matter how much your child flings their hat around those peonies are not going anywhere! (It might be worth whilst pointing out now that you WILL burn yourself on the hot glue. I did it several times whilst making the hat. Perhaps it is the universe’s way of keeping ying and yang – beautiful hat/burnt fingers). Once all the flowers are attached that is it. The glue dries very quickly and soon it will be ready to be worn. You can really customise your hat to your taste – be creative! (I intended putting a nice pink organza ribbon on first before I put the peonies on, but in my excitement – ooh, glue gun – I forgot until several hours later.) You can create something really unique for the fraction of the cost in shops. Miss H loves it! 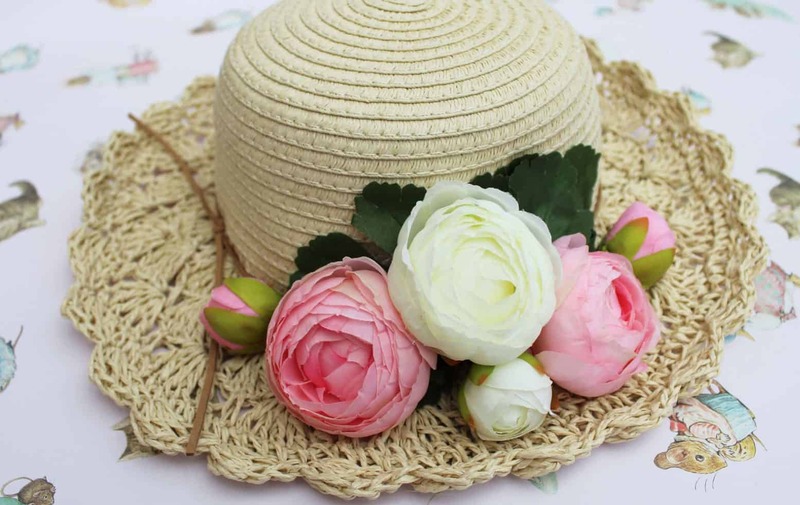 Seeing how personalised summer straw hat trends are making waves on the internet, I have shared with you in just few easy steps, how you can easily make your own. You know what’s more? You can customise this craft project to make it truly YOUR own. The good thing about labelling projects using custom woven or printed labels such as those produced by Wunderlabel is that it gives your craft an authenticity and sophistication that you won’t get using just markers or other manual labelling options that might not prove lasting anyway. This personalisation option also comes in handy and ideal when you make the straw hat for someone special as a gift. It could also be that you just really wish to hang it on your wall as a memento of sorts. Whatever your straw hat making needs are, put an icing on the cake by getting a lovely customised label to go with it. Summer straw hats, whether large, small, or medium sized are fun to make and the steps are so easy. Now you can go out this summer, spend lots of time soaking up the sun rays at the beach, the pool side or just under a tree with your self made, personalised straw hat on! What a way to make your fun statement this summer! Please add me to Pinterest!